With great pleasure, I invite you to visit my online stores. personal choice printing technologies keep improving. Online shopping is easy and convenient. 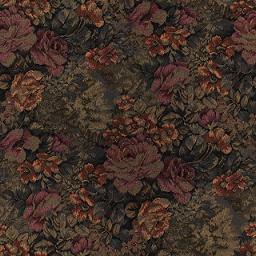 Thank you for shopping at my stores! How many hours a day do you work to support the people and programs called the Government? What percentage of your time and life energy goes to fund faceless bureaucracies and the banking cartel called the Federal Reserve? Do you feel as though you are a Tax Slave? Do you get any bailouts? 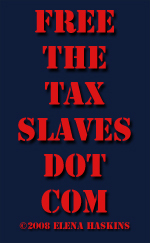 Click here or on the image for the Free The Tax Slaves dot com site with information and merchandise. The sun at the top of a tree. Blue sky. Montains covered with snow. Snow laden evergreens. White runes with red glow. White text with green glow. 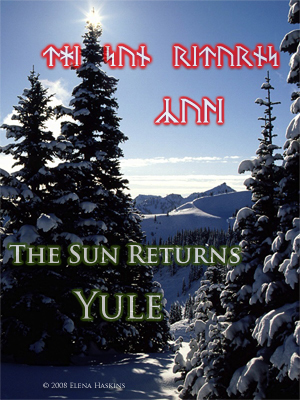 Please click here or on the image to go to The Sun Returns store. Whether saying "Thank You" to your loved ones and associates, or simply affirming your thanks for all that is good with your life, "Thank You" can reduce stress and enrich life. Thank You products can be gifts for others and reminders for your Self. Some of us of Nordic ancestry have yearned for the organic spirituality that was a part of everyday life for our ancestors and makes welcome sense to us now. 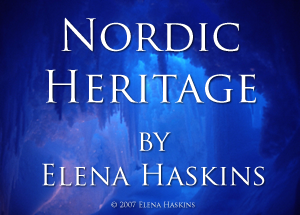 The rich heritage of Nordic spirituality lives within our consciousnesses. Asking illuminating questions can begin the most interesting conversations. Clarity is always welcome. 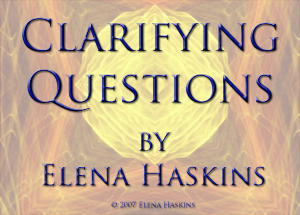 Simply by wearing your favorite questions, you can stimulate those who see you to answer the question for themselves. Sometimes there is a need for Not Serious. Sometimes it feels good to wear apparel or use objects with designs that are a bit peculiar or puzzling or eccentric. Fun can be healthy. 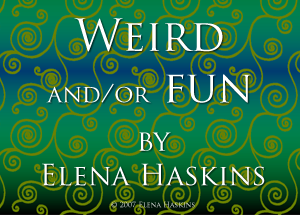 Weird can be wonderful. Copyright © 1996-2008 Elena Haskins. All Rights Reserved.